David W. Hoyt, The old families of Salisbury and Amesbury Massachusetts : with some related families of Newbury, Haverhill, Ipswich, and Hampton, and of York County, Maine / David W. Hoyt., Vol. 2, , at https://archive.org/stream/oldfamiliesofsal02hoyt . Providence, R. I.: Snow & Farnham, (1897) , p. 676. Vital records of Amesbury, Massachusetts to the end of the year 1849, , at https://archive.org/details/vitalrecordsofam00ames . Topsfield, Mass. : Topsfield Historical Society, (1913) , p. 68. Vital records of Amesbury, Massachusetts to the end of the year 1849, , at https://archive.org/details/vitalrecordsofam00ames . Topsfield, Mass. : Topsfield Historical Society, (1913) , p. 388. Vital records of Amesbury, Massachusetts to the end of the year 1849, , at https://archive.org/details/vitalrecordsofam00ames . Topsfield, Mass. : Topsfield Historical Society, (1913) , p. 135. Vital records of Amesbury, Massachusetts to the end of the year 1849, , at https://archive.org/details/vitalrecordsofam00ames . Topsfield, Mass. : Topsfield Historical Society, (1913) , p. 136. Vital records of Amesbury, Massachusetts to the end of the year 1849, , at https://archive.org/details/vitalrecordsofam00ames . Topsfield, Mass. : Topsfield Historical Society, (1913) , p. 137. Vital records of Amesbury, Massachusetts to the end of the year 1849, , at https://archive.org/details/vitalrecordsofam00ames . Topsfield, Mass. : Topsfield Historical Society, (1913) , p. 129. Vital records of Amesbury, Massachusetts to the end of the year 1849, , at https://archive.org/details/vitalrecordsofam00ames . Topsfield, Mass. : Topsfield Historical Society, (1913) , p. 134. David W. Hoyt, The old families of Salisbury and Amesbury Massachusetts : with some related families of Newbury, Haverhill, Ipswich, and Hampton, and of York County, Maine / David W. Hoyt., , at https://archive.org/stream/cu31924025963772 . Providence, R. I.: Snow & Farnham, (1897) , p. 106. Frederick Lewis Weis, The Colby family in early America; early generations of the descendants of Anthony Colby of Boston, Cambridge, Salisbury and Amesbury, Massachusetts, 1595-1661, , at https://books.google.com/books?id=TXdGAAAAMAAJ . Caledonia: The Colonial Press, (1970) , p. 11. COLBY FAMILY & OTHERS at http://freepages.genealogy.rootsweb.com/~colby/colbyfam, /d134.html citing Index to births, early to 1900 New Hampshire. Registrar of Vital Statistics. living at Weare, Hillsborough County, New Hampshire. "New Hampshire, Birth Records, Early to 1900," index and images, FamilySearch (https://familysearch.org/pal:/MM9.1.1/FL2R-RP8 : accessed 01 Dec 2012), Hannah Q Colby, 03 Feb 1823. 1880 United States. Census Office. 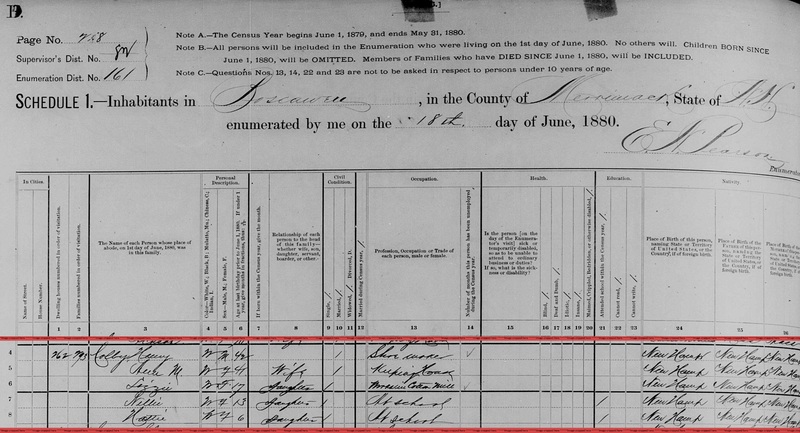 10th census, 1880 federal population census, Washington, District of Columbia: National Archives and Records Service, ([19--]) , Census Place: Weare, Hillsborough, New Hampshire; Roll: 764; Family History Film: 1254764; Page: 615D; Enumeration District: 157; Image: 0700. 1900 United States. Census Office. 12th census, 1900 population census schedules, Washington, District of Columbia: Bureau of the Census Micro-Film Laboratory, ([197-]) , Census Place: Weare, Hillsborough, New Hampshire; Roll: 948; Page: 26A; Enumeration District: 0137; FHL microfilm: 1240948. 1910 United States. Bureau of the Census. 13th census, 1910 population census schedules, Washington, District of Columbia: Bureau of Census Micro-Film Lab, ([19--?]) , Census Place: Weare, Hillsborough, New Hampshire; Roll: T624_864; Page: 5A; Enumeration District: 0181; ; FHL microfilm: 1374877. "New Hampshire, Death Records, 1654-1947," index and images, FamilySearch (https://familysearch.org/pal:/MM9.1.1/FSV8-ZYM : accessed 01 Dec 2012), Hannah I. Gardner, 14 Nov 1911. John O'Hanlon, "Re: "Andrew J Colby," Your RootsWeb inquiry," e-mail message from e-mail address to Steven G. Levine, 8/4/2009 12:04 PM. Colby, Harold S. driver Railway Express Agency. resides Franklin. 1920 United States. Bureau of the Census. 14th census, 1920 population census schedules, Washington, District of Columbia: The National Archives, ([193-?]) , Census Place: Franklin Ward 1, Merrimack, New Hampshire; Roll: T625_1012; Page: 1A; Enumeration District: 87; Image: 650. 1910 United States. Bureau of the Census. 13th census, 1910 population census schedules, Washington, District of Columbia: Bureau of Census Micro-Film Lab, ([19--?]) , Census Place: Swanton, Franklin, Vermont; Roll: T624_1615; Page: 10A; Enumeration District: 0177; ; FHL microfilm: 1375628. Tracy Elliot Hazen, The Hazen family in America, , at https://books.google.com/books?id=BlQZAQAAMAAJ . Thomaston, Conn.: R. Hazen, (1947) , p. 353. 1880 United States. Census Office. 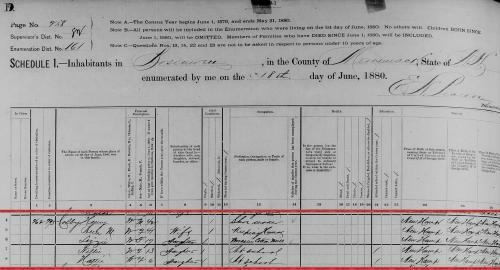 10th census, 1880 federal population census, Washington, District of Columbia: National Archives and Records Service, ([19--]) , Roll 765 Bow #110/115. COLBY FAMILY & OTHERS at http://freepages.genealogy.rootsweb.com/~colby/colbyfam, /d135.html. 1900 United States. Census Office. 12th census, 1900 population census schedules, Washington, District of Columbia: Bureau of the Census Micro-Film Laboratory, ([197-]) , North Dakota > Cass > Kinyon > District 0036 > 6. 1910 United States. Bureau of the Census. 13th census, 1910 population census schedules, Washington, District of Columbia: Bureau of Census Micro-Film Lab, ([19--?]) , North Dakota > Cass > Kinyon > 0031 > 5. "New Hampshire Birth Records, Early to 1900," database with images, FamilySearch (https://familysearch.org/ark:/61903/1:1:FL2R-R2N : 12 December 2014), Harvey G Colby, 17 Jan 1844; citing Weare, Hillsborough, New Hampshire, United States, Bureau of Vital Records and Health Statistics, Concord; FHL microfilm 1,000,378. Harrison Colby, A genealogy of the descendants of Abraham Colby and Elizabeth Blaisdell, his wife, who settled in Bow in 1768, , at https://archive.org/details/genealogyofdesce00colb . Concord, N.H.: Printed by the Republican Press Association, (1895) Microfilm #896944 of the Family History Library, Salt Lake City, Utah, p. 119 gives the year of birth as 1875. 1880 United States. Census Office. 10th census, 1880 federal population census, Washington, District of Columbia: National Archives and Records Service, ([19--]) , Census Place: Boscawen, Merrimack, New Hampshire; Roll: 765; Family History Film: 1254765; Page: 47D; Enumeration District: 161; Image: 0700. "New Hampshire, Death Records, 1654-1947," index and images, FamilySearch (https://familysearch.org/pal:/MM9.1.1/FSL4-Y54 : accessed 24 Nov 2012), Hattie Rowell, 21 Apr 1891. 1900 United States. Census Office. 12th census, 1900 population census schedules, Washington, District of Columbia: Bureau of the Census Micro-Film Laboratory, ([197-]) , Minnesota > Hennepin > Minneapolis Ward 8 > District 0084 > 22. Ancestry.com, Minnesota, Territorial and State Census, 1849-1905, [database on-line]. Provo, UT: Ancestry.com Operations Inc., (2007) , 1875 > Hennepin > Minneapolis Ward 3 > 15. 1880 United States. Census Office. 10th census, 1880 federal population census, Washington, District of Columbia: National Archives and Records Service, ([19--]) , Minnesota > Hennepin > Minneapolis > 233 > 25. Ancestry.com, Minnesota, Territorial and State Census, 1849-1905, [database on-line]. Provo, UT: Ancestry.com Operations Inc., (2007) , 1885 > Hennepin > Minneapolis > 114. 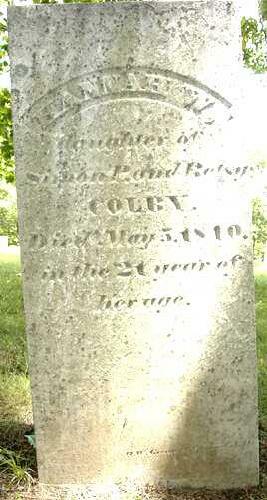 Hazen Colby was born in 1794.